Ettan is one of the oldest snus brands in Sweden. A loose (lös) type snus with a full-bodied tobacco flavor and hints of smoke and peat. Originally manufactured by J.F. Ljunglöf, Ettan Snus has been established on the Swedish since 1822 and was the world's first steam pasteurized snus. Ettan is one of the oldest snus brands in Sweden. A loose (lös) type snus with a full-bodied tobacco flavor and hints of smoke and peat. Originally manufactured by J.F. Ljunglöf, the famous snus producer, Ettan has been established on the Swedish market since 1822 and was the world's first steam pasteurized snus. Decided to add some loose snus to my recent order. Glad I did. Really helps with urges of using American Dip. Usually use portions but wanted to try loose. This being my first full can of loose ( did try one prilla from an associate of General loose once ). I have to say the flavor is very good. Love the full bodied tobacco with salty and smokey elements. Interesting enough this is different than the Ettan portions which have a more pronounced chocolate tone. I like both, but this one is great for anyone wanting a smokey and full bodied tobacco taste. Ettan has been my go to snus for years! perfect tobacco and salt flavor. no disgusting chemical taste like some other brands. very similar to Prima Flint, and Roda Lacket. but for me, Ettan is the best of all. This is the loose snus that turned me off most portions. It hand bakes easily, and lasts for over an hour. The flavor is perfectly balanced with mild tobacco, salt, and a hint of herbs. Ettan goes well with coffe, beer, and whisky. It delivers a satisfying amount of nicotine, without being overwhelming. Give it a try. So similar to Prima Fint, but Prima has a different roundness than Ettan... Ethan has a smokier flavor, but with equal strength as Prima. I really enjoy this snus. Not over bearing at all, and i do not get any chocolate as others have mentioned (as a note, i have been using Gotlands Pasksnus, which IS a chocolate tasting snus!). 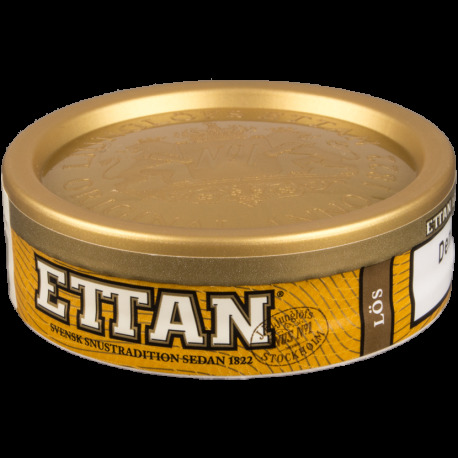 Very tobacco centered snus with hints of a smokey flavor, get yourself some Ettan! Click order - Thank me later! Its that good. It took me a while to realize that this smells like stinging nettle. That's a nice way to say it smells a little like a horse stall. Earthy hay smell, but oddly pleasant. It has a little chocolate, but nothing like the portions. I'd definitely recommend it, but only if you want a more natural flavor. Not very much drip, Taste alot better then the general white I tried for straight tasting tobacco flavor. Forms a pris with the icetool little tighter then I prefer when just injecting in my lip so push it out roll in fingers to loosen it a bit otherwise doesn't seem to release any flavor, or very little. Only complaint I have is wish it had higher nicotiene in it noticed on this first can bout 35 minutes into a pris or what ever it is called that i'm looking at the clock hoping it been atleast a hour to put a new one in. Though it does get me to a hour or hour an 20 minutes before I absolutely am wanting a new 1. This is an old friend to me! My #2 go to Snus. Always buy this in rolls as I HAVE to have to have it on hand. The classic flavor is so smooth and delicious. one of my all time favorites. It's actually my 2nd snus Iv ever tried and it was love at first pinch. The love grown stronger the more I got into the can. Makes a really nice/easy prila and even a hillbilly pinch. Has such a smokey/ traditional flavor. Id highly recommend getting this. My second favorite los snus after Roda. I like it better than General los. Delicious snus!!! Can't really go wrong with this one. It's basically General minus the bergamot. As a big fan of bergamot (Earl Gray tea being my favorite blend), General will remain my go-to product, but Ettan is definitely a quality choice. High quality and no frills, great product. This is really a great los. I like Ettan alright as an original portion now, but the white and los are where it's at for me. As someone that just uses los from time to time, I would say that you really don't get Ettan until you have had it in los. Ettan los is messy, harder to use, and a beautiful wonderful thing once you get it. I received several cans of Ettan Loose in trade recently. As a fan of the portion type Ettan snus, I wanted to try the loose and see what it was like. As I have read elsewhere, the loose is milder than the portion, which just seems odd. I mean, without the pouch to hold back direct contact of the tobacco with the inside of your lip, I figured it'd be stronger. It's not, it is very mild. I waited to do this review after my PrisMaster showed up, because I can't hand bake worth a darn. The flavor is the same as the portion varieties, and it seems to take a little longer to get going, flavor-wise. Once it does, though, it lasts for a very long time. It has all the great flavor I've come to expect from Ettan. I got a good two hours of awesome Ettan flavor out of that first pris. The ending wasn't pretty, and I had to rinse my mouth out to get rid of the remnants of what I've heard called the mudslide. All in all, I like the loose fro the flavor and the duration, and I may buy a roll in the future, but the ease of the portion varieties cannot be over looked. Portions don't last as long, but they are easy to discard. Simply the best. Packs a prilla with minimal effort. Great smooth taste that isn't overpowered by added flavors. Not too salty or sweet. Just the perfect blend of sweet tobacco met by a perfect balance of slight salt and bitterness. It's pretty hard to not go back to the can for more and more. Many think it's an acquired taste snus that you work up to. I think that it's the ultimate beginner snus. You don't get tired of the flavor like you would with the newer brands. Definitely my favorite. Ettan Loos Snus is a great product. The aroma, texture, and flavor are very pleasing. You are greeted with a rich tobacco smell, the texture is moderately coarse with enough moisture to carefully hand-bake or use a portioning tool, and the flavor is mild tobacco and light salt and it does not burn. I would say that I like it in some ways better than Roda Lacket or General loose, mainly because the flavor is mild and pure and does not burn as much as the others. The roll I ordered is extremely fresh and has a good date. Highly recommended.